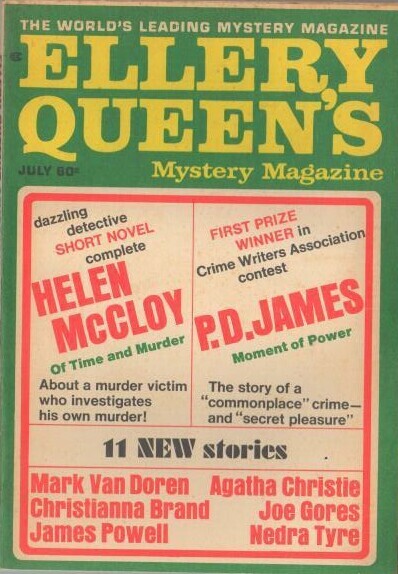 6 · Moment of Power · P. D. James · ss; First Prize Winner in the Crime Writers Association Contest Sponsored by EQMM last year. 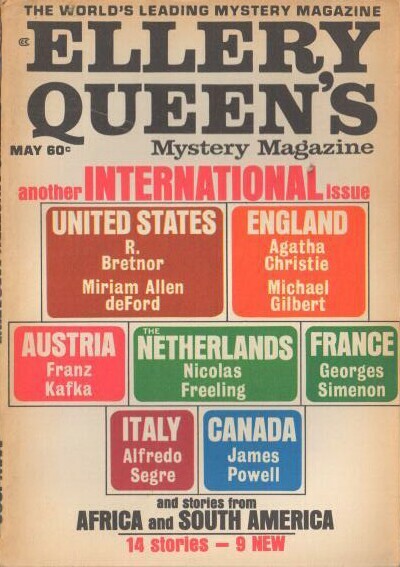 127 · My Brothers Keeper · Michael W. Fedo · ss; in EQMMs Department of First Stories. 149 · Daniel Kearny Associates File #3: The Pedretti Case [Daniel Kearny Associates] · Joe Gores · ss; Second Prize Winner in the Crime Writers Association Contest. 6 · The Gemminy Crickets Case · Christianna Brand · nv; Second Prize Winner in the Crime Writers Association Contest. 24 · The Ptarmigan Knife · Miriam Allen deFord · ss; Second Prize Winner in the Crime Writers Association Contest. 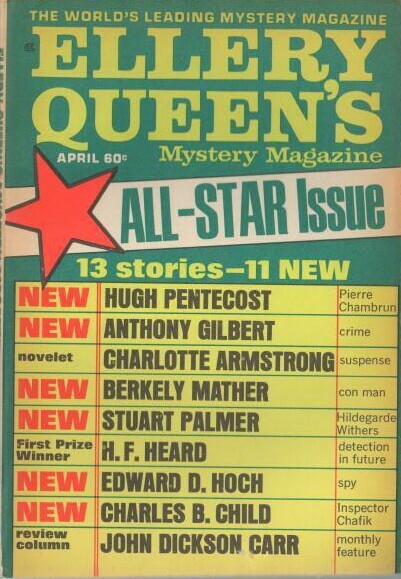 42 · What Were All Hooked On · Rhona Petrie · ss; Honorable Mention in the Crime Writers Association Contest. 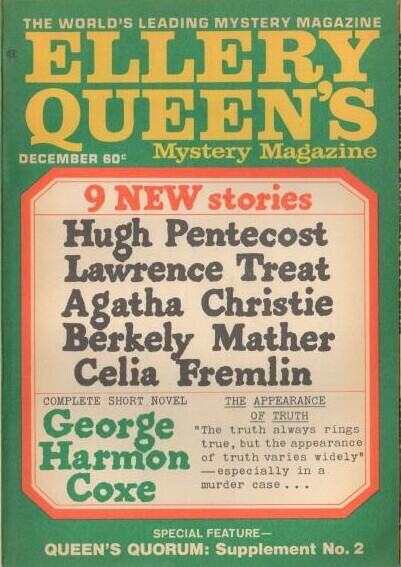 112 · To the Last Detail · Louis Gregory Low · ss; in EQMMs Department of First Stories. 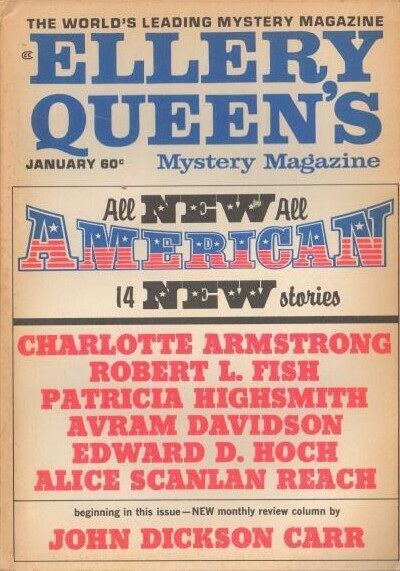 116 · Wide O- · Elsin Ann Gardner · vi; in EQMMs Department of First Stories. 6 · The Sisterhood · Gwendoline Butler · ss; Second Prize Winner in the Crime Writers Association Contest. 39 · Locals Should Know Best · Guy Cullingford · ss; Honorable Mention in the Crime Writers Association Contest. 64 · All You Need Is Guts · Ben Smethurst · vi; in EQMMs Department of First Stories. 67 · The Adventure of the Conk-Singleton Papers [Sherlock Holmes] · John Dickson Carr · pl The Unicorn Mystery Book Club News v1 #9 1949; play performed at the Mystery Writers of America annual meeting, April 1948. 71 · Inspector Maigrets War of Nerves [Insp. 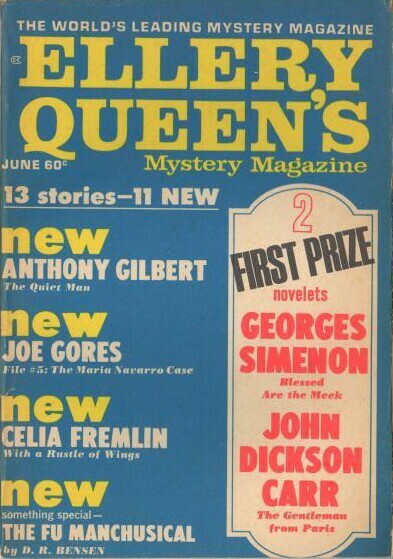 Jules Maigret] · Georges Simenon; translated by Eileen Ellenbogen · ss; the translation is copyrighted 1965 but no prior publication has been traced. ; translated from the French (Peine de Mort, Paris-Soir-Dimanche, November 15, 1936). 135 · Miss Mouse and Mrs. Mouse · John Burke · ss; Honorable Mention in the Crime Writers Association Contest. 148 · A Matter of Probabilities · James Cross · ss; Second Prize Winner in the Crime Writers Association Contest. 99 · Start from Scratch · Jerome L. Johnson · ss; in EQMMs Department of First Stories. 106 · E.Q. 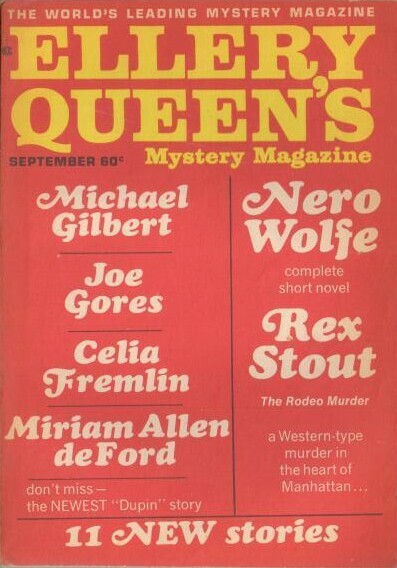 Griffen Earns His Name [Ellery Queen Griffen] · Josh Pachter · ss; in EQMMs Department of First Stories. 57 · Two Women Too Many · Jack Leavitt · ss; in EQMMs Department of First Stories. 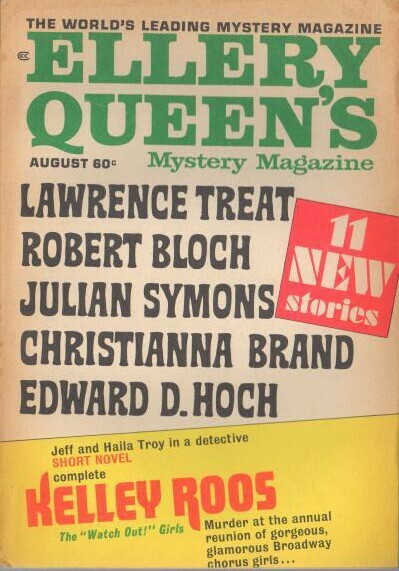 105 · The True Adventure of the Second Stain [Sherlock Holmes] · W. Heidenfeld · ss; given as by H. Heidenfeld in the Table of Contents. 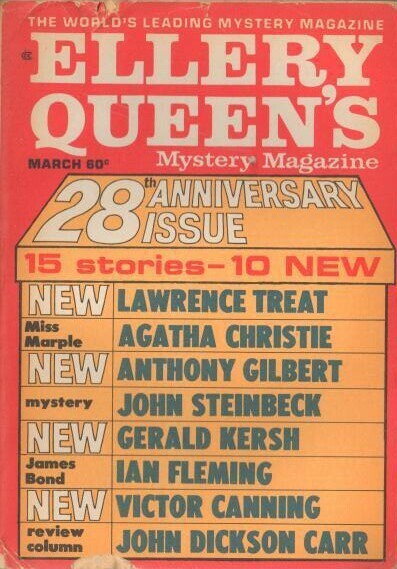 28th Anniversary Issue. 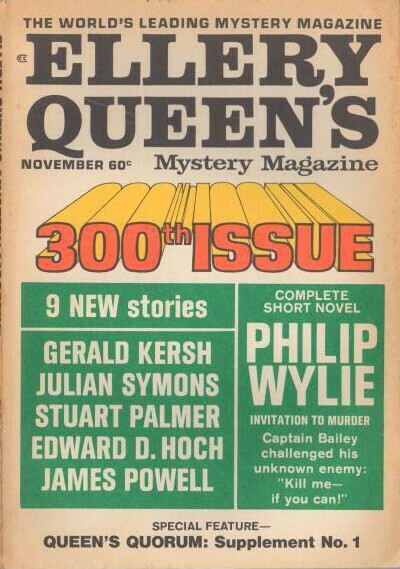 Details supplied by Douglas Greene. 88 · The Man in the Barn · Katherine Rambeau · ss; in EQMMs Department of First Stories. 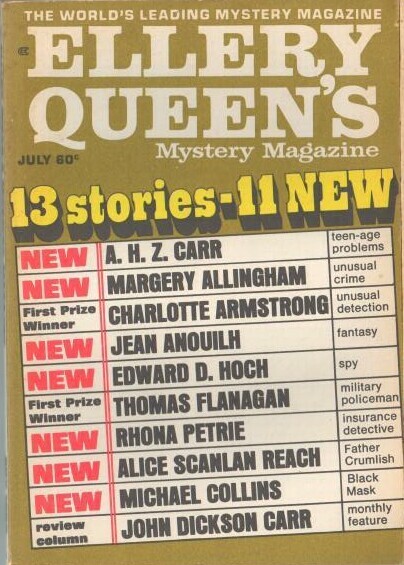 95 · Ransom in Unmarked Bills · Jane Perry · ss; in EQMMs Department of First Stories. 33 · A Scrap of Tinfoil · Alfonso Ferrari Amores; translated by Donald A. Yates · ss Michigan Alumnus Quarterly Review Win 1960; translated from the Spanish. 67 · Inspector Maigret Hesitates [Insp. Jules Maigret] · Georges Simenon; translated by Jean Stewart · ss; translated from the French (Monsieur Lundi, Paris-Soir-Dimanche, December 20, 1936). 99 · A Fratricide · Franz Kafka · vi The Penal Colony, Schocken 1948; translated from the German (Ein Brudermord). 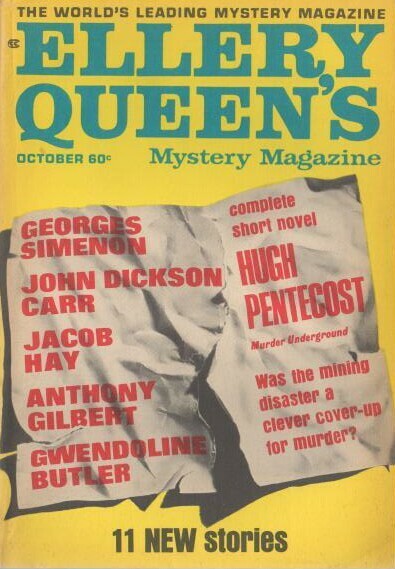 19 · Blessed Are the Meek [Kachoudas] · Georges Simenon; translated by Frances Frenaye · nv Ellery Queens Mystery Magazine Apr 1949; translated from the French. 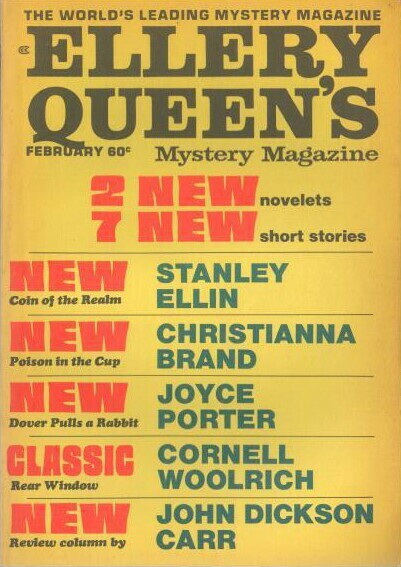 79 · The Man in the Revolving Door · Robert Edward Eckels · ss; in EQMMs Department of First Stories. 147 · The Fu Manchusical · D. R. Bensen · pl [Sax Rohmer]; a comic play based on Sax Rohmers Fu-Manchu.